Claim the Reload Bonus at Juicy Stakes Poker this weekend and get something extra -- a ticket to a $10K satellite tournament. 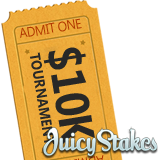 Juicy Stakes is one of the most popular online poker rooms on the Revolution Poker Network. To claim a 100% up to $100 Reload Bonus use reload code RELOAD06 when you deposit. You'll be sent a ticket to any weekly $10K Satellite Tournament. Claim a reload bonus up to $100 and get a ticket to a satellite tournament free. The poker tournament schedule at Juicy Stakes, which welcomes players from around the world, is extra busy for the next week or so. Loads of extra freeroll poker tournaments have been added beginning with an extra $250 Freeroll tomorrow night. $250 Freeroll Tournaments have been added June 4, 11, 18, 25 at 11:00 EDT. There are extra $150 Freerolls June 9, 16, 23 at 7:00 pm EDT, June 10, 17 and 24 at Midnight EDT and June 23 at 7:00 pm EDT. The current CPT Punta Cana online satellite tournament series wraps up with the Final on Sunday. You can still enter a Step 2 game in the 3-tier series daily at 4 pm EDT until Saturday where you can win your way to Sunday's Final. Sunday's winner gets a $4000 prize package to play in a live tournament in the Caribbean this fall.